Sorry! We're No Longer Offering Art Demos - We're Closing! At Jerry’s New York Central, we’re committed to educating artists of all levels. You’re never too young, too old, too experienced, or too new to learn. Visit our convenient Greenwich Village location to ask your art questions and get advice before we close! Talk to some of our friendly and talented staff members. Each employee at Jerry’s New York Central is an artist themselves, and all of them are dedicated to helping you realize your artistic visions. Jerry’s New York Central is more than just a New York art supply store. We also offer online art classes for free on our Youtube page, so you can practice your craft or learn a new art form on your own time, whenever you like. We have over 2,000 art lessons on video to explore — that’s over 10,000 hours of instruction just waiting for you to take advantage! Looking for a more hands-on approach to supplement your at-home training? Talk to one of our expert employees, and we’ll be happy to help! Our crew prides itself on its stellar customer service, and you can expect the same great experience at all of our free, in-store demos. At Jerry’s New York Central we understand what it means to be a New York artist. We also know that even the best artists can use some snacks and company every now and then. That’s why we added some food and fun into our special events. When you’re looking for the right way to get your kick off your weekend, you’d have a hard time beating our Wine Down Fridays. 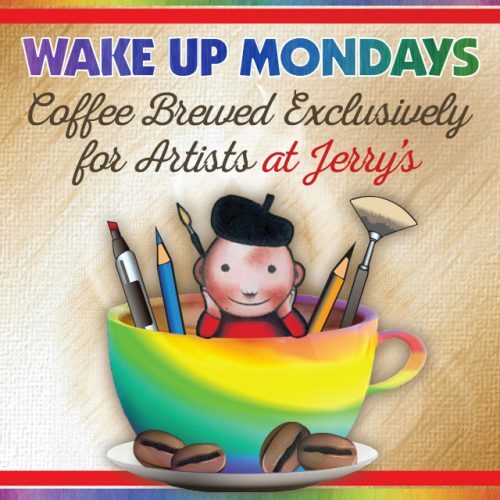 Meanwhile, we understand what it’s like to have a case of the Mondays, which is why we put together our Wake-Up Mondays events to start your week with a little coffee and creativity. Join us at Jerry’s NY Central for our array of fun events throughout the week. So what do you want to learn? We’ll show you how to use faux painting techniques to imitate wood and marble, or you can learn the basics of drawing and painting with watercolors. You can look for specific, kid-friendly projects or find a tutorial that will show you the finer points of brush technique. Looking for more resources to further your personal art education? We have additional resources to supplement art classes and lessons. Take a look at our collection of art education books, reference books, and even color wheels to help you get just the right mix when you’re composing your total painting. Need even more ways to learn? Check out our Facebook Live lessons for interactive lessons every Tuesday. You can register for reminders on our Facebook page and take part in our fun, humor-filled lessons with other like-minded artists from around New York and the world. We provide supply lists and take questions that you ask online. Join us to get your art lessons by taking advantage of social media. You’ll have a blast! When you’re looking for NYC art supplies, come to Jerry’s New York Central at 111 4th Ave, New York, New York. We have a full range of all the tools you need, and we’re happy to share our techniques in art lessons, too. From art supplies to expert skills, you can find them all at Jerry’s NY Central. Check out all we have to offer to New York artists today! We have locations all across the country. © 2019 Jerry's New York Central (Formerly Jerry's Palette Shop) All Rights Reserved.